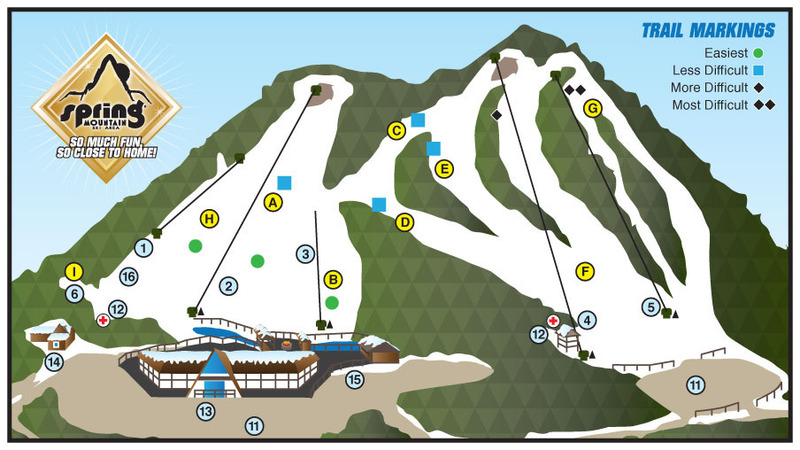 View the trails and lifts at Spring Mountain Ski Area with our interactive trail map of the ski resort. Plan out your day before heading to Spring Mountain Ski Area or navigate the mountain while you're at the resort with the latest Spring Mountain Ski Area trail maps. Select resorts also feature an additional trail map from partner, FatMap that provides a 3D view of the ski resort, including slope steepness and aspect, along with information on what it's like to ski each of the trails at Spring Mountain Ski Area. Variable conditions with 12-28 inches. Double and triple lift open but crossovers are not finished yet. conditions are good for the weekend after a giant rainstorm and warm weather. Lifts are a littlw tricky to get off without getting slammed by the lift. Nachos at the pig with the crock of chili is damn good. Bored tonight, but it is 50 degrees. No lines. Couple of dirt spots on Extreme. Grizzly is best tonight. They did a really good job with the snow considering the weather but the guy at the rental window was very rude. Get Snow Reports, Powder Alerts & Powder Forecasts from Spring Mountain Ski Area straight to your inbox!